Show Season is About to Begin! Are you ready? We almost are. Just some few last minute details to complete then we’ll be ready to roll out the welcome mat! Remember, our first show is just 9 days away in Spirit Lake, Iowa in the Expo Building at the Fairgrounds. We look forward to seeing your smiling faces there! 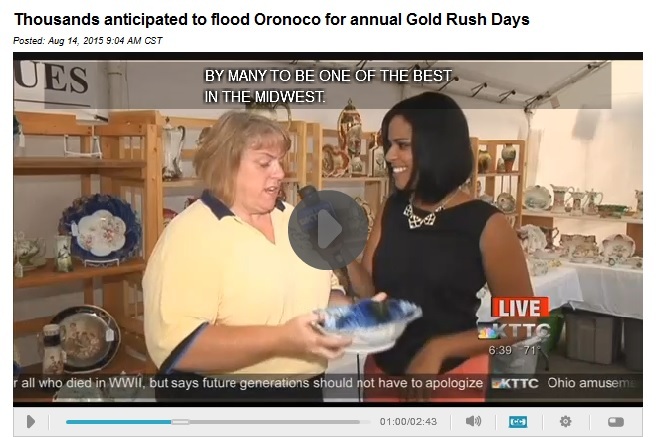 Thousands anticipated to flood Oronoco for annual Gold Rush Days – KTTC Rochester, Austin, Mason City News, Weather and Sports. One day Michael and I went to an antique show in Valley Junction. We were browsing — you know just walking by the booths — looking in occasionally. We had been there about 30 minutes when Michael stopped dead in his tracks. In front of him was an entire booth of 1950’s amberina glass — and he was mesmerized. The colors were bold and many of the pieces were over-sized. Michael didn’t know what it was — where it came from — or how it was made. All he knew is that he wanted it! We bought a few pieces that day — and then set out to learn more. The first lesson that we had to learn is that there is a big difference between what many dealers call “old” amberina and “flashed on” or “painted” amberina. Old amberina was made from a batch of amber glass that contained gold. Adding gold to the mixture made the glass very heat sensitive. And glassblowers quickly learned that if a piece got too close to the furnace after blowing — a red color would develop on the part that was reheated. These “mistakes” were discarded until 1883 when Joseph Locke and Edward D. Libby of the New England Glass Company decided to capitalize on these occurences and patent the process. 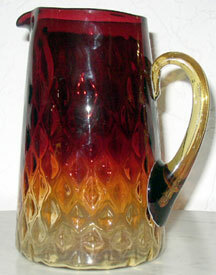 To create a piece of old amberina glass — glass blowers blew and shaped a piece using the amber glass that contained gold. They left the piece attached to the pontil rod and re-inserted it into the furnace glory hole after they were done shaping it. The part of the piece closest to the fire turned a ruby color with the color graduating from red at the top to amber at the base. If a piece was “slightly overheated” the red color turned a reddish purple or fuchsia shade. Today, this deep fuchsia shade seems to be the most desirable among collectors – not only is it very beautiful, but this fuchsia coloring almost always indicates a late 19th century piece. Take a look at the flashed-on piece in the picture on the right. Notice how the coloring is not as graduated as the piece on the left. 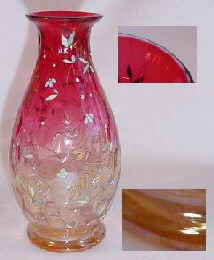 Flashed on pieces are NOT made of heat sensitive glass. 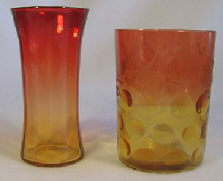 To make flashed-on amberina glass makers took a piece of amber glass and applied a top-coat of gold to the piece. The piece was then re-heated. The glass made in this fashion does not change colors — only the coating changes color. Often times you’ll find flashed-on pieces where the coating is flaking off. 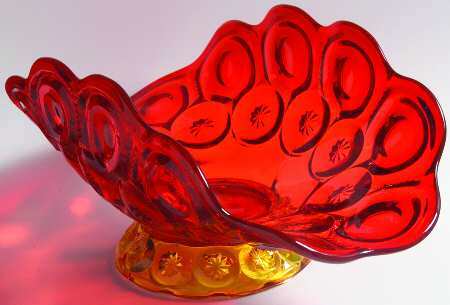 Other companies created an amberina effect by painting the entire glass surface with a mixture of copper oxide and yellow ochre and then firing the piece. After cooling, it was repainted and reheated to develop the ruby color. Pieces made in this fashion are easy to recognize because they have an iridescent finish. 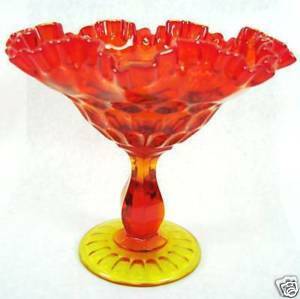 Many new collectors confuse “old” amberina with “flashed-on” or “painted” amberina. And that can be a costly mistake. “Old” amberina is hard to find and very collectable. “Flashed-on” and “painted” amberina has LITTLE to NO VALUE. The second lesson we had to learn was the difference between “old” amberina and 1950’s amberina. “Old”amberina wasn’t seen much after 1915. But in the 1950’s a new, bold and modern amberina hit the market. Just like old amberina — the glass used to make 1950’s amberina is heat sensitive. But instead of using gold in the glass — glass companies like Blenko, Pilgram and Kanawha used selenium or iron to transform their pieces. This chemical change had a huge impact on the final color of these pieces. Instead of soft ambers and purple-reds — vibrant yellows and bold oranges and reds were created. And once again the public responded to this unique color combination. Amberina became a favorite color choice throughout the 50’s and 60’s. Old amberina is still the most difficult to find and the most expensive to own. But 1950’s amberina has it’s followers. A lot of collectors remember seeing 1950’s amberina in their parent’s and grandparent’s home — and they want to bring some of that nostalgia into their lives. So what happened with Michael’s collection? 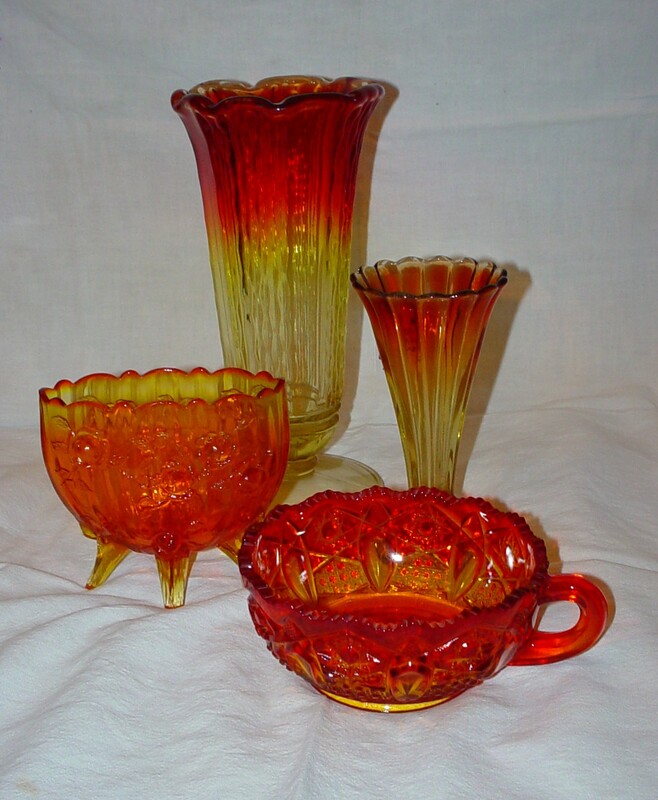 It’s been more than 15 years since that day in Valley Junction and now Michael has 40+ pieces of 1950’s amberina glass in his collection — most of it Blenko. He proudly displays it in the cabinets and window sills of our walk-out basement. And he’s still shopping — forever on the lookout for giant Blenko floor decanters — some of which go for $500 – $800. Yep — that man-of-mine has expensive tastes!